Thanks to the federal “Every Student Succeeds Act” (ESSA) – a bill over 1,000 pages long that was passed in a rush after Thanksgiving, 2015 – every state must submit an educational “plan” to the federal Department of Education – essentially asking “permission” for educational practices and programs. One of Utah’s “asks” was the submission of a waiver request – I urge you to read Superintendent Dickson’s excellent letter championing parents rights and reaffirming state law. Current ESSA provisions mandate that 95% of students must participate in the computer-adaptive assessments – the tests formerly known as SAGE in Utah. The request for that waiver was denied by the Federal Department of Education. After being denied by the unconstitutional Federal Department of Ed, the State Board asked again for a one year reprieve from reporting requirements. Once again we were denied followed up by a threatening letter by Sec. DeVos. Remember this President and his team vowed that they would eliminate the DOE and uphold state sovereignty. This additional denial and subsequent letter threatening funds from Sec. DeVos is further proof that ESSA strangles state sovereignty and the natural rights of the people. As new negotiation attempts began, it became clear that Utah would only be “granted” its measly federal funding if it was compliant with the 95% rule. PROBLEM: Thanks to the few vigilant Utah parents who have fought this federal intrusion, there is a Utah state law which doesn’t grant parents the right to opt out – but rather affirms that because of natural, God-given rights which parents have, Utah schools would be prohibited from draconian tactics which would penalize Utah families and students from opting out of assessments. In an email from Superintendent Dickson to elected State Board members, dated July 13, 2018, she explained that Utah’s new negotiated educational plan had been approved, stating: “The Department felt strongly that in order to approve our plan, we needed to include language indicating we will comply with federal law. The approved plan does this.” Sadly, thanks to a manipulation of Robert’s Rules during our Aug. 3 board meeting, the Board did not discuss this new plan that was presented to Sec. DeVos, unilaterally, by the Superintendent and state board’s staff without board approval. TRANSLATION: The Superintendent and the Board Chair acted independently of the elected board. In short, the public was not given the chance to weigh in on the ESSA plan because those who were elected to represent them were never given the chance to see or to vote on the new plan. Instead, administration and a single board member presented a plan to the federal DOE that puts it in direct conflict with Utah State law–a state law which prohibits the violation of natural parental rights. In the end, after being denied repeatedly, Utah became fully compliant with Federal dictates, setting aside the promise of the state’s ability to forge their own educational path. And now, thanks to further ESSA provisions, Utah must submit to federal “auditing” – an invasive probe to determine why so many parents are opting out of assessments, and thereby placing non-compliant schools in a status of “failure” or “remediation”, to be put under the purview of federal overseers. You may ask: exactly what is the paltry amount of funding Utah receives from the federal government? Unfortunately, the answer will shock and anger you: a whopping 6% of our entire educational budget for 2017-2018 school year. Of that, the amount Utah stands to lose if it stops playing this ridiculous game of “Mother May I” is significantly less (around 2% of Utah’s educational budget). Utah parents, we are literally selling our birthright as the natural guardians of our children for a mess of pottage – and a pathetically meager mess of pottage at that. And why is the amount so small? Because any dollar that is sent to Washington naturally shrinks as it goes through its laundered process of paying the salaries, benefits, and pensions of unelected, unaccountable bureaucrats. That dollar shrinks to practically nothing before it ever comes back to the states. And to add insult to injury, we then must play this game of kissing rings and genuflecting, begging holy dispensation from the federal DOE to even get that pathetic, shrunken amount, and facing even more oppressive penalties if we are further non-compliant. This isn’t about opting out of a test; this is about where we believe our rights come from. Either our rights come from God or man. It should be unacceptable to all Utah parents that we must ask permission of the federal government concerning our children. I urge parents to contact their state legislators requiring them to come up with that 6% – by spending less somewhere else – so we can take back our children’s education. Please contact your State Board members and let them know that you expect them to defend your parental rights. This is an election year and we the people hold the power. Contact those in office and those running for office and see where they stand. When I was sworn into office, I took an oath to defend the Constitution. This oath requires me to protect the rights of the people that I represent and this newly accepted ESSA plan is in direct violation of those rights. Parents, I know you are tired and it feels like no matter what we do things keep moving forward. But we need you! As an elected official I am merely the point of a spear. We, the people, are needed to give the elected officials the force and the direction for their actions. those students on their achievements and wish them a successful future. Consolidated State Plan for ESSA (Every Student Succeeds Act) to the U.S.
many of you on these important issues. feel free to reach me at michellekboulter@gmail.com or 435-668-0758. Please take the time to look over the newsletter and share any feedback that you might have! It has come to my attention that the “alternative” test being given to your child if they opt out of SAGE is in fact still the SAGE test, just not recorded. This is happening in MANY of our schools and is an outright attempt to subvert your rights as a parent.. I am sharing with you State Law and our Board Rule so that you can be aware and better defend your divine right. 1- It is against the law for ANY points to be given towards a student’s grade regarding SAGE testing. Pay close attention to the word reward- This includes participation points for taking SAGE, prizes given for SAGE scores, and field trips awarded for high SAGE scores. (iii)may not reward a student for taking an assessment described in Subsection (9)(a). 2- It is against Board Rule to use the SAGE test to determine a student’s grade. The test can not be used to determine if your child can or can not take an AP class. If you are being told this, it is against Board Rule. 3- Some LEA’s are using what is written here regarding an alternate assessment as a green card to offer it to all students. That is not the case. Read it carefully and you will see that you may exercise the right to exempt your child from a state required assessment, this includes any alternative assessment that your school claims is required by the State. (1)(a) Parents are primarily responsible for their children’s education and have the constitutional right to determine which aspects of public education, including assessment systems, in which their children participate. (b) Parents may further exercise their inherent rights to exempt their children from a state required assessment without further consequence by an LEA. (b) students are excused by a parent or guardian under Section 53A-15-1403(9) and as provided in this rule. (3)(a) A parent may exercise the right to exempt their child from a state required assessment. One of my favorite things about serving on the State School Board is touring our local schools and meeting the wonderful administrators in our area. During one such meeting, the topic of my recent radio interview with Kate Dalley regarding a parent’s right to opt out of the SAGE test came up. The administrators were concerned that I had relayed a few of Utah’s laws regarding parental rights to the radio listeners. In discussing the merits of parental rights, they felt that parents didn’t know what was best for their children. They tried to reason with me that it was better for school administrators to keep parents from fully understanding parental rights laws in order to protect the schools. Until this moment, it never occurred to me that someone could be offended by laws that advocate for parents, let alone our own, public school administrators. Yet, throughout the meeting, it became clear that there are administrators in our own community that truly believe that their educational background and experience take precedence over parents in making decisions for the children of Southern Utah. 1- What guidelines do local administrators use to assess what is in the best interest of the child and how do they regard the expertise of the parents as they make these assessments? 2- What measurements do the administrators use to decide if the parents are qualified to make educational decisions for their own children? 3- Will parents only be regarded as competent if they agree with the administrators? 4- What laws or statutes endow administrators with the power to decide a parent’s worthiness to make decisions regarding the education of their children? 5- Who are administrators accountable to if they make decisions for a child that end up negatively impacting that child? Parents, please talk to your school administrators and make sure they understand that the family is the fundamental unit of society. We are grateful for school officials that serve our community at the pleasure of the parents. 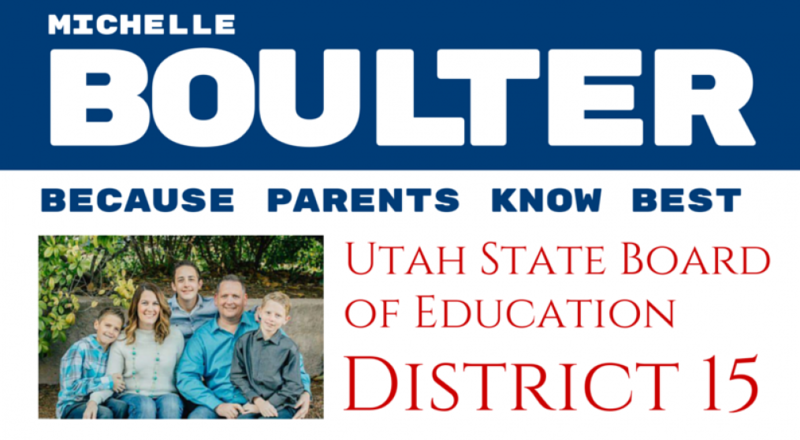 Vote on November 8th to #ElectBoulter! I will uphold the tenants of parental rights and local control of education.